King Mohammed VI has outlined the guidelines that are likely to enhance the role of the Cen-Sad grouping as a preferred interlocutor for the resolution of the crises plaguing the Sahel-Sahara region, through a coordinated approach with the other Regional Economic Communities, the African Union, the United Nations, the European Union and other stakeholders. 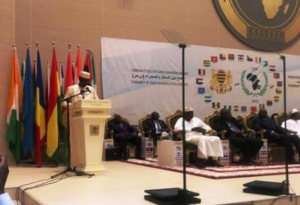 In a message to the conference of heads of state and government of CEN-SAD convened Saturday in N’Ddjamena, Chad, the Moroccan Sovereign called for enhancing the effectiveness and efficiency of the Cen-Sad community’s executive bodies; establishing the various institutional structures provided for in the revised CEN-SAD Treaty, in particular the Permanent Peace and Security Council and the Permanent Council in charge of Sustainable Development; and for devising a strategy dedicated to human development in the Sahel-Saharan region as well as programs for the integration of young people. The Sovereign also called in the same vein for ensuring the effective implementation of the strategy to combat terrorism and violent extremism; ensuring the operationalization of the CEN-SAD 2015-2050 Security and Development Strategy; and developing a common policy on border security and adopting an operational action plan. King Mohammed VI reiterated in this connection Morocco’s willingness to share its experience in combating terrorism and violent extremism with CEN-SAD African Member States, noting that the Moroccan experience is based on the triad defined by security, religion and the fight against vulnerability and poverty. He pointed out further that if these measures are supported by a revamped education system geared towards creativity and human resource development, the community would be able to ensure the protection of the current and future generations. King Mohammed VI also called on members of the CEN-SAD community to enhance further their economic complementarities, inclusive co-development and joint actions against security challenges to speed up regional and continental integration. He said this community has great potential for development, growth and complementarity, with a GDP in excess of $1 trillion and a population of some 600 million, and significant natural resources. The CEN-SAD has been providing itself with the tools that will enable it to contribute actively to regional and continental integration processes, added the Monarch, who urged this regional bloc to foster the efficiency of its executive bodies, set up strategies dedicated to human development and the fight against terrorism and adopt a common policy on border. The Sovereign recalled that Morocco has always sought to ensure the emergence of the Sahel-Saharan region by maintaining fraternal relations with all member countries based on cooperation, solidarity and respect for their sovereignty and territorial integrity, underlining the North African Kingdom’s commitment to South-South cooperation, paving the way for an integration that is conducive to investment and trade and that targets co-development. With that in mind, Morocco has worked actively to establish a network of actors involving both the private sector and civil society. This policy has led to the setting up of three Commissions, one for the Sahel Region, one for the Congo Basin Region and the third for Island States, in addition to the adoption of the “triple A Initiative” for the adaptation of African agriculture, the King recalled. He also reiterated Morocco’s commitment to give fresh momentum to the CEN-SAD as a Regional Economic Community of the African Union, stressing the need to strengthen CEN-SAD’s action for the promotion of peace, stability and development in the Sahel-Saharan region. Morocco became member of the grouping in 2001. CEN-SAD was established in February 1998, one of its goals being to achieve economic unity through the implementation of the free movement of people and goods in order to make the region a free trade area. Originally, this bloc was set up to combat desertification, drought and climate change, before becoming a community dedicated to the promotion of cooperation and sustainable development, the preservation and consolidation of peace, security and stability, the fostering of political dialogue and the fight against all forms of organized cross-border crime. Posted by Hafid El Fassy on April 14, 2019. Filed under Columns, News, Zoom. You can follow any responses to this entry through the RSS 2.0. Both comments and pings are currently closed.